This race was the most disappointing for me of the whole series. The course was unique and challenging, but I completely missed my opportunity to stay in the top 3 or 4 riders overall. The course was a lollipop style course with a 5 mile circuit through a national forest that we did 9 times. There was one steep climb about 3/4 of a mile long on the circuit. There were some attacks on the first couple laps and eventually a small group of maybe 2 or 3 got away. Then on the 3rd time up the climb, somebody attacked and it was superfast up the climb. Coming across the top, I made it halfway to the race winning breakaway that had formed, but when I saw one of the top riders not making it into the break I figured that I could ease up and let that team chase. Big mistake! For some reason, they were fine with that rider not making it into the break. If I had drilled it at that precise moment instead of easing up, then I possibly could have made it into the break. Then what would that team have done? I’m not sure, but now I have to live with making that mistake until the next time the same situation comes up and hopefully I will have learned NEVER to hesitate in a situation like that. Live and learn! I relaxed for several laps to save up energy for one “catch-them-by-surprise” attack, but it didn’t work and I only stayed away for a couple miles before being reeled back in at the base of the climb. I resigned myself to saving energy for the finishing sprint to try to get some minor omnium points, but I ended up losing the wheel I was on and then sitting up dejected instead of sprinting all the way to the line. Another lesson learned – NEVER give up! I was a bit happier with how this race turned out. I had two teammates make the drive over from Alabama for this race, and that helped a lot with them covering moves and forcing other teams to expend energy chasing them down. I knew that again I was going to be pretty marked so I didn’t try to attack unless I was joining a rider from a team who would be happy to let us go. This never really materialized and so we ended up sprinting for 10th place. I got third in the sprint, giving me 12th for the race. 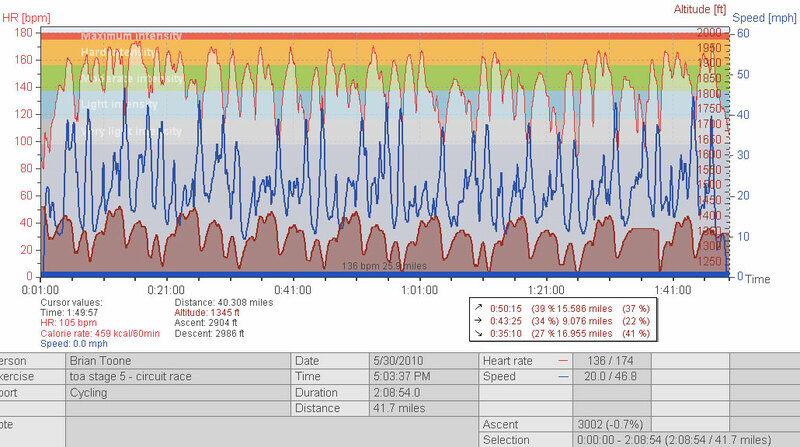 My garmin was working for this race so I’ve included my heartrate data below – no zone 5 efforts – even in the final sprint. 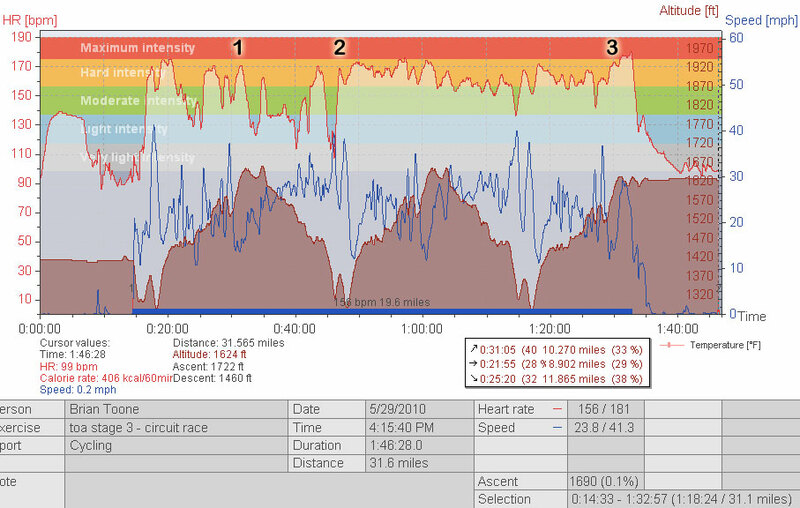 Team Ion/United Healthcare decided to prevent all attacks by sacrificing two strong riders (Oneal Samuels and Pat Allison) early in the race by having them maintain a steady hard tempo that nobody really felt like attacking. Once we made it to the steep stairstepping hills before the start of the 4mi climb, there were several attacks and our pace would skyrocket and then ease as everybody caught back on across the top and on the steep downhill. Cesar Grejales put in a hard solo attack shortly after we reached the bottom of the 4mi climb. Nobody could follow him, but our pace upped dramatically. Eventually a group of 3 or 4 got a short gap on the exploding field. I followed Brendan Sullivan (the current race leader) as he surged to go across the gap. He made it and then a little while later I caught up to the group with a few other riders joining up on a false flat and short downhill before the next step of the climb. This part was the longest, and it saw our group of about 10 riders shatter. I started out on the front side of the shatter but then by the top of the climb, I had fallen back to one last group of three riders including Tiago Depaula right as we crested the climb. Tiago was driving the move and encouraged me to help him chase. The two of us bombed the downhill tucking and reaching speeds of close to 60mph! Towards the bottom of the 4.5 mile descent, we came flying up into the back of the group of 5 or 6 riders in front of us. By the time we made it all the way down the mountain, our group had increased in size to 13 riders. I was trying to pass two Team Ion riders in the overall and I just needed to get 3 more points than them in the finish to do it. So I was watching them pretty close, and when an Ion rider went up the road – I thought it was one of them so I helped chase pretty hard. Imagine my surprise though when the rider I was watching out for pulled up beside me. I thought to myself “oops!”. I then sat in and watched people attack as we made our way to the finishing sprint. In the sprint, I tried to be patient but ended up being on the wrong side when the lead riders slowed up. The attack went up the right-side and after I made it around the slower riders on the left, I made up some ground and ended up 5th in the sprint for 6th in the race — with Cesar Grejales having already taken the win solo. So all-in-all it was a great weekend of training and racing! 4 days, 6 races, 275+ miles of racing!!! 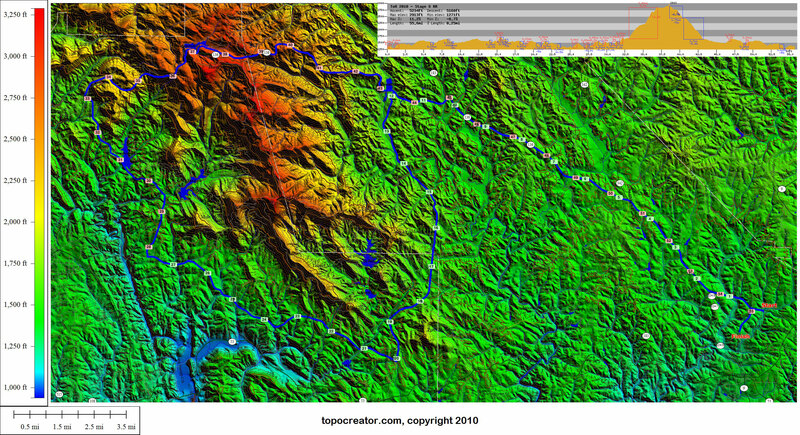 This entry was posted in Racing and tagged heartrate, topocreator on June 2, 2010 by kartoone.